We use it for client development and some expansion work. We have an administration team that channels configuration. While this is happening we monitor the lifecycle of a customer as they progress throughout the various buyer stages. Using what we find out about the lifecycle internally, we try to effectively transform that to actionable items. This can be in the form of CTAs, dashboards, whatever. Bionic Rule Capabilities -- Rules engine is extremely powerful. The way I look at it is as if it's a bonafide ETL tool living inside a workflow management tool. Through rules you can put together powerful queries that really makes your workflow management great. C360 -- Gainsight excels at being able to bring in all sorts of data into one place. Call to actions - Through the rules engine call to actions can be incredibly specific so we can target any point of the customer lifecycle with strategic ctas based off our data. I think that reporting functionality is getting there. Inline calculations would be a huge improvement. Filtering on Aggregated fields also would be nice. I think being unable to edit programs once they are on is very concerning. Why can't participants be brought in under some sort of logic, then we can edit and tweak as we iterate upon our first program? Workflow Management - Perfect. If you want to use your data strategically then this is a big plus for you. Health Scores - Great health scores and health score update capabilities. We personally worked with the Gainsight data science team and they did a great job at getting our predictive scores helped out. Support - Excellent support, they are so responsive and will make sure the problem you have is solved/answered. Con: Reports - Reporting is good, don't get that wrong. But, if you're looking for a robust Tableau-esque platform then this doesn't quite live to that mark. But that makes sense, Gainsight is sort of the jack of all trades tool in my opinion. Reports Management - Really difficult to manage reports. Need more filters on the report management section. We are currently using Gainsight for all levels of our customer journey. Gainsight and the outreaches/advanced outreaches have allowed us to scale via automation. It also allows us to deliver that "just in time" approach to provide resources. We are also using Gainsight for renewal automation as well. Automated outreaches - allows for being able to scale. Calls to action - allows for the use of automation to monitor data and create actionable items based on the data; scalability. Reporting- allows quick/easy access to reporting on customer health with automated, actionable items. The backend setup of Gainsight is not that intuitive. Gainsight is great for being able to automate the onboarding experience for low/tech touch customers; creating actionable items along the way. Being able to monitor the overall health of an account to help curb churn is also nice. Review: "Benefits and Opportunities for Improvement with Gainsight for an On-prem Multi-product Company"
Gainsight is being used by the customer success managers in the organization to provide them with a 360 view of their customers and to help them streamline the CS processes (i.e. customer onboarding) and document key customer interactions, success plans, risks and opportunities for account growth. Ginsight is a great product but needs more help to cope with the complexity of an on-prem multi-product enterprise company. 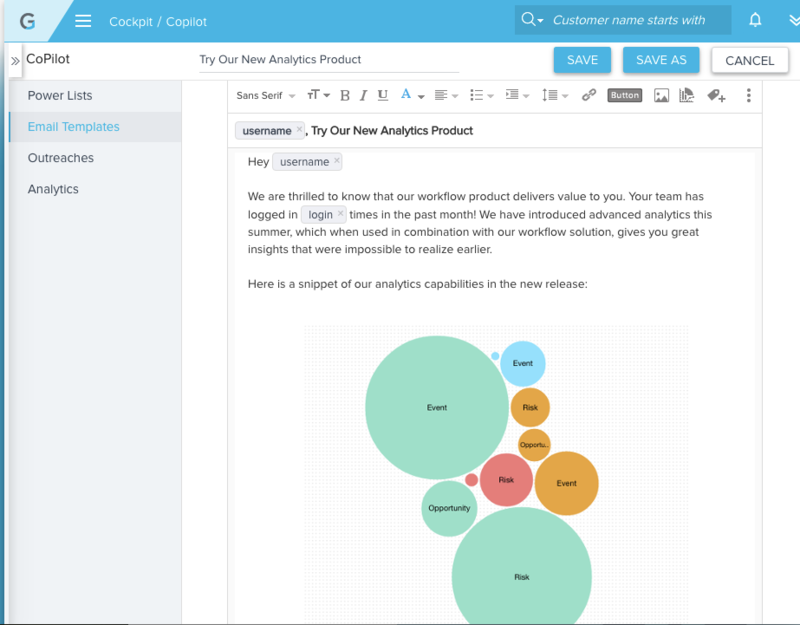 If you are a mid-sized SaaS company, Gainsight is one of the greatest investments you can make. For large on-prem multi-product businesses, Gainsight also makes a difference, although complexity and scale can be a challenge (as for any other tool I suppose). User Review: "First 6 months with Gainsight"
We are using Gainsight globally within our Customer Success Management and Account Management functions. It is designed to address all classic CSM requirements, fundamentally to operationalize and standardise our methodology to support growth. Very deep integration possibilities with SFDC allow highly sophisticated business logic and rules to be constructed. Pulling together of lots of disparate sources of information into a unified view is a substantial time saver and allows clearer 'big picture' context. Creation of dashboards that present lots of reports in a single view allows for quick analysis. The Program feature is complex to manage and counter intuitive in certain areas. A simple revision requires the whole program to be cloned and a new version created. Greater customisation around the report presentation would be useful, such as the colours used - sometimes it is hard to see. Better slicing and dicing around NPS (by region, team, etc) as far as NPS score is concerned. Out of the box you just get a global value. Gainsight requires quite a lot of investment in the admin side and requires someone who is good with software - it needs a power user to make the most of the feature set, you certainly can't set it up and leave it if you expect to get the most out of it. If however you have a complex data structure and want to produce bespoke and challenging business rules, then with the appropriate investment in resources you can achieve most things. Review: "Gainsight is a really useful customer management tool"
Gainsight is the primary tool of our customer success organisation. We sync it with various systems to pull important data points into one place. Our leadership team has a snapshot of what's going on with a given customer at any moment, through having access to features such as the health score and timeline. Mass communications made and tracked with ease. Timeline is great, but quite silo'd. Would love to see a widget that allowed timeline/notes to be taken outside of the platform. Gainsight Sally for Slack is useful but it's a tool many sign-out of in a meeting environment. Great for keeping a record of health of a customer over-time, and perfect for handing an account from one CSM to another for a business, less loss of information. 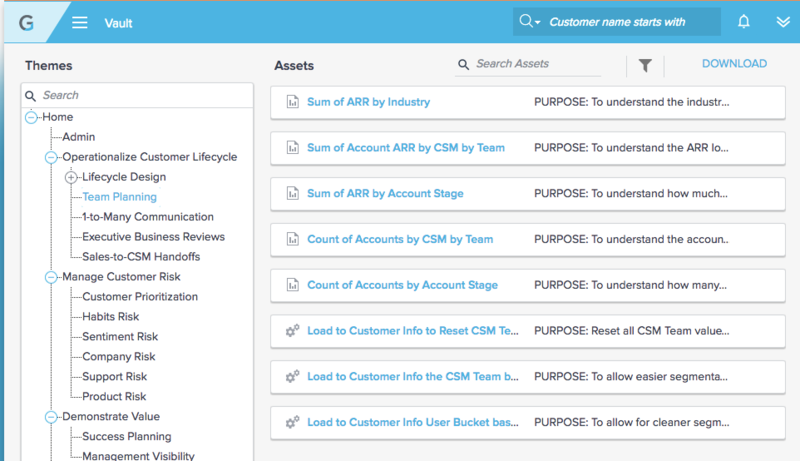 Gainsight is being used by the CSM team within the customer success department. It allows us to track health, expirations, metrics, and activities against a client, segment, country or region. The timeline feature allows you to create a diary within a customer's profile and you can easily distinguish what each entry is e.g call, meeting. You can also say if that call was positive or negative, how long it took and who was on the call internally and externally. Gainsight connects back to SFDC and all activities are logged so there's no need for anyone to have access to Gainsight if they're not going to proactively be using it. 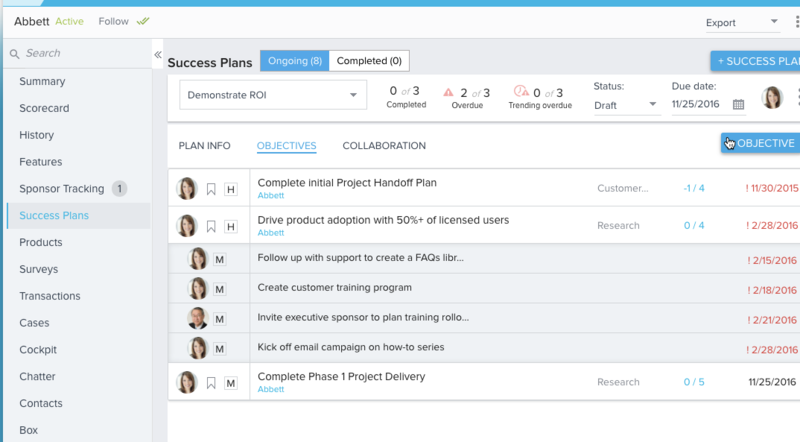 The cockpit allows you to segment your to do list for today, tomorrow, next week, month or year! Gainsight is used as our internal CRM for keeping up with customers, tracking their escalations, making sure that the status of their 'temp' is readily apparent to other users of Gainsight like our salespeople and other customer success managers. Review: "Gainsight is the future of customer success"
Gainsight is being used at our organization as a customer success tool to trigger knowledge-based actions in order to ensure customer retention and product adoption. Triggering actions based on knowledge and information gathered from the account. Showcasing a 360-degree view of the customer account. Giving you the capability of aligning multiple sub-customers under the same customer by the relationship View. Since Gainsight works on top of Salesforce lightning can be a bit latent in Speed and Performance. There is no way to get alerts for individual accounts you only can set up a feed which gives you alerts for all the accounts. Managing multiple relationships with customer as well as the customer success life cycle. User Review: "Gainsight is Great!" We needed to get a better understanding of churn in our organization, but also to get a better understanding of our customer base. Gainsight allows us to track customer satisfaction and create scorecards that help us work better with our customers. We can be more proactive than reactive to customer issues and concerns. Calls to Action - When certain conditions are met that we have created, Gainsight will alert the proper personnel to take the next steps. Single pane of glass - Gainsight allows us to see everything about a customer in a single view, utilizing various graphs and easy to understand information. Communication - Gainsight allows us to reach out to all or specific segments of our customer base. We can send informational, marketing or surveys and track customer response over time. Gainsight does not integrate well with all systems. Must have Salesforce to use Gainsight. Better documentation on integration or assistance. Gainsight can do a better job at ensuring their customers are utilizing the product to the best of their ability. Gainsight gives you the big picture of your customers. You can track pretty much anything about them as well as include all of your applications and how the customer is being affected by them or using them. In the hosting industry, Gainsight can track customer outages and monitors (with custom integration). Review: "Setting my sights on a long future with Gainsight!" We are currently utilizing Gainsight for our Customer Success team and looking to expand into other teams with a long term goal of company wide use. It serves as our main CRM database and is quickly growing into our primary communication tool with our customers (email templates, surveys, etc.). Gainsight helps us keep communication flowing between the CSM and management, and has been an invaluable tool to keep all of our customer notes and details in one place to streamline internal transitions. Pushing 'to do' items out to our CSM team both by rules/filtering customer criteria or by uploading hand-picked lists of customers for special projects. Their Cockpit gives our CSMs a single place to go to see all of the action items for the day, week, etc. They can be grouped by type, due date or priority which allows each of our CSMs to customize their view and work how they work and prioritize best. Dashboards are incredibly easy to build and allow management a visual insight into our customer data. Any data we can create a report on we can add to a dashboard. Global filters have been a HUGE addition, allowing us to quickly filter an entire dashboard by CSM or Team Manager with very little effort. Gainsight's Timeline feature is a key component of our Gainsight usage. It was incredibly easy to roll out to our team initially and adoption has been great. The new Global timeline was a much needed addition which now allows us to see all timeline entries in one place and filter by CSM or account very easily. Customer support is top notch! Their support platform allows us to very easily submit requests, track its status and email communication back and forth with the support team is quick and easy. Workflow from an admin perspective leaves something to be desired. For example, creating a CTA for our CSMs so send to their customers requires access to 3 completely separate admin areas of Gainsight. 1. Journey Orchestrator to create the email template 2. Cockpit to create the playbook and 3. Rules Engine to actually create/send the CTA. This is a fairly simple task and one we do often, but the whole process seems disconnected. Reporting on admin related data could also be a big improvement. The dashboards and tools to report on our customer data is great, but finding information to help me better manage/update our ongoing templates, rules, etc. is difficult. Great for managing customer communication (emails, phone calls, trainings) and just general 'need to know' notes between internal teams, particularly for those companies with lots of CSM transitions. We just made a pretty major reorganization and having this information in Gainsight helped us tremendously! The only scenario where I would hesitate to recommend Gainsight is if a company had a very unique/complicated customer or CSM structure. Gainsight is really designed for the bulk of information to live on the account level and our company has a lot of data/different CSMs on a relationship level. It is doable, but makes simple tasks that much more difficult to configure. We use Gainsight in Customer Success as a tool to help us proactively manage our customers. We have a mix of high touch and low touch, Gainsight helps us manage the mix. Other departments within our org utilize this to quickly check the customer temperature. Gainsight's use of CTAs with daily reminders allow us to trust we are not missing the little things with our customers. Gainsight gives you the ability to create health scores for customers that not only encompass systematic information but subjective customer temperatures as well. Giving you a true way to measure health. Gainsight works well with our internal systems, so we are not adding more steps to our day-to-day routine. I have not run into an area with usage where I think Gainsight is missing, however I am sure there are many more use cases beyond ours. Gainsight is amazing at helping automate your low/tech touch accounts. Gainsight is used across a few departments: Professional Services, Support, Success Management and Product Management. Our product [team] uses the application to conduct NPS, our Professional Services team documents and tracks the progress of onboarding and the Success Management uses it to manage the day to date activities to nurture and support the customer. Gainsight was purchased to allow us to scale with our 1-many customers' segmentation and to organize the day to day activities required to support a customer. 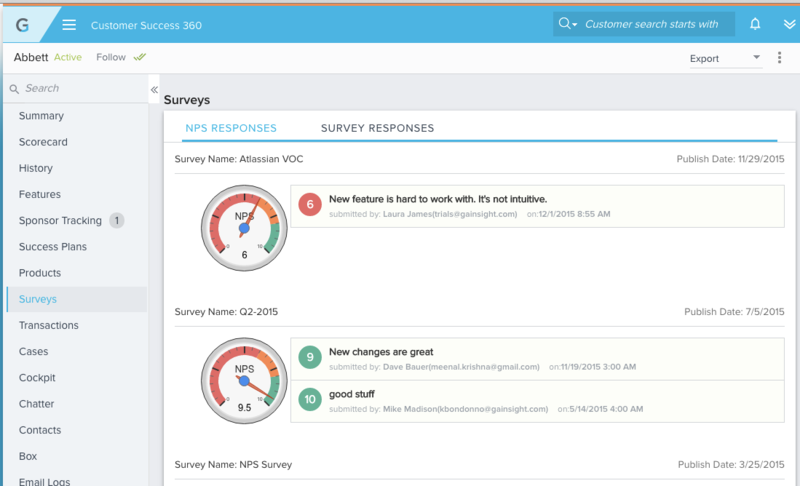 NPS and other surveys - the automation is fantastic. Makes it easier to go to a central location to see all relevant information relating to a customer. Email notification on actions or CTA could use some work. Notifying the person responsibile of the day's activities. The ability to push email notifications into the application for visibility would be ideal. Today we can push it to Salesforce but those activities are tracked differently than calls and other check-ins. if you are looking to automate a 1-many approach, Gainsight is very good! I would recommend having a CS Ops person to support it. Generally a good fit for an enterprise organization. Gainsight Review: "A New Users Point of View"
Gainsight is currently being used by 75 employees within a single Department of our Company. Its purpose is to create a single point of record for the users. Making their day to day tasks easier by only needing to visit one software/website - rather than several. Reporting/Dashboards. At first, depending on how your Data is loaded, it can be a little overwhelming when first in the Report Builder. But once you understand where your data is coming from - ensuring you are pulling the proper fields...It's amazing and VERY simple to use! Gainsight Community. As an ADMIN of the software - I find that their Community is one of the bests around! Having the ability to post a comment and get feedback from people all over is amazing! Another perk of the community is also reading how others are using the software. Reading how some people were handling certain issues and how they resolved it with the software has helped us update some of our configurations. Support. Their actual support is also amazing! Friendly, courtesy - and they treat your problem as their problem! Their User Interface is one of the best that I've seen. Making it easy for a user to navigate to various sections of the software - it's a real treat compared to some of our former CRMs. Have a full-time ADMIN. Gainsight is very back ending heavy during the initial setup and configuration of the software - especially if you're converting. But once you get it going - it's awesome! The main reason I would recommend it is because of the support they provided. No matter the question, simple configuration to advanced - they have someone that will assist you through the whole process. They are amazing! Review: "Gainsight is a great way to improve the daily lives of your CSMs!" 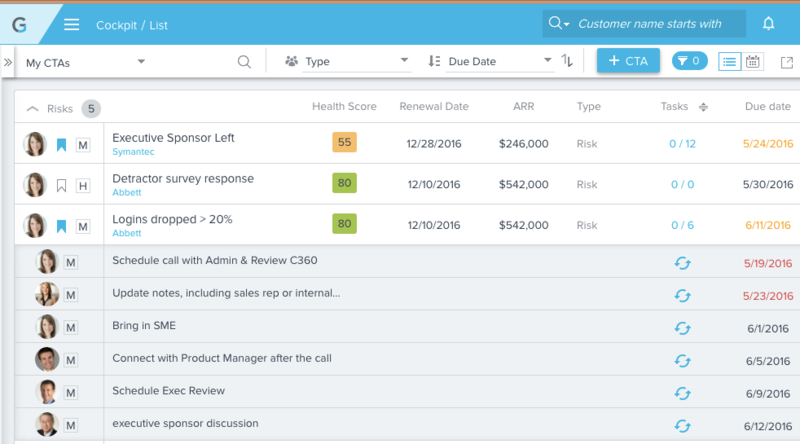 Gainsight is being used by the Customer Success team within my organization. We leverage our customer data to manage at-risk customers and grow the lifetime value of our healthy customers. Our Customer Success Managers can be proactive instead of reactive to their books of business. The reporting capabilities provide insight into our customers and we can design them specifically for our CSMs, Management and Executives. Tech Touch assists in automating outreaches. Dashboards provide valuable reports to our team. Gainsight Support needs to improve their documentation from an Admin perspective. Gainsight to SFDC linking needs to be enabled for MDA data, not just SFDC objects. Success SnapShot needs to have more fonts, formatting options for PPT. If you are looking to utilize your customer data to better understand your customers then it is for you. Review: "Gainsight is a powerful tool to dive in to the details on a customer and get a high-level view of your customer base"
Gainsight is currently primarily being used by our Customer Success department, but other people can view some of the output via Salesforce. It helps us manage our customer relationships and updates. I enjoy using the Timeline feature to keep track of each customer I work with to ensure their success. I like having the CTA's readily accessible in a global view for all customers so I can gauge where I am on certain open tasks. The ties into Salesforce are very useful so that others in our company can stay updated on customer health. Shifting from Timeline to Detailed view could be better for viewing of notes and product/customer details. Reporting and Dashboards could be more visibly appealing and have more easily accessible information. I hear there was a new release this week, so some of this might be addressed. Multi-product views could be improved, and losing score card information when customers purchase multiple products is really tough to go through! It's well suited for SaaS environments and harder for on-premise solutions, which is how we use it at the company I work for. It's great for notes and history keeping. It's also good for sharing of scorecards/overviews with others outside of the CSM team, but not always easy to do so. User Review: "Gainsight is Amazing!" We use Gainsight solely in our Customer Success department currently. We use Gainsight to help in monitoring account activity as well as mitigating portfolio risk. 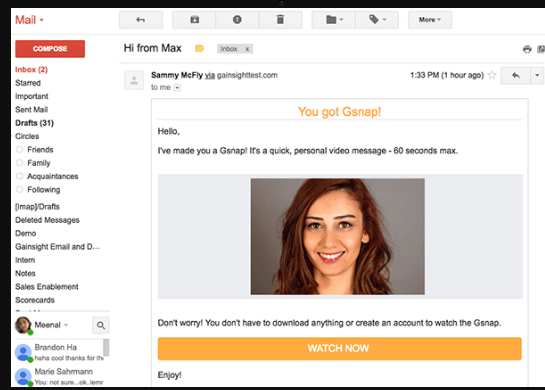 Excellent at sending automated emails and generated semi-templated emails with auto-generated content. Great at logging activities via the timeline feature for an account. Graphing/Data Visualization functionality is very limited. Gainsight works really well for us in assisting to manage our self-service portfolio, where there isn't a specific CSM assigned to an account. It helps in managing communications to these accounts as well as monitoring and bubbling up potential pockets of risk. 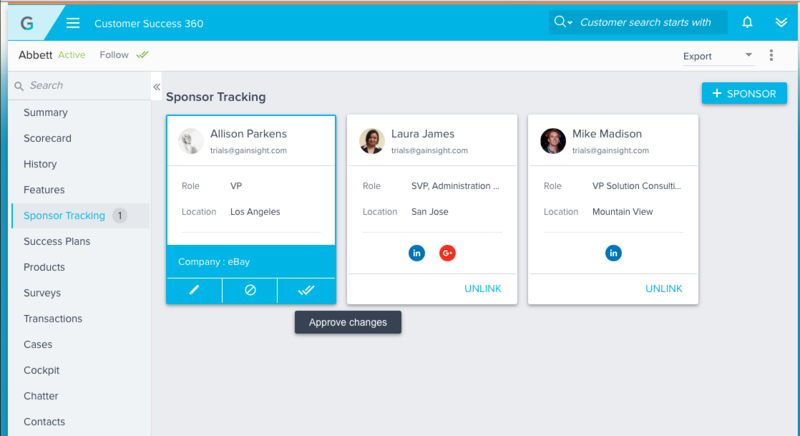 Additionally Gainsight is very helpful in our managed portfolio in helping to automate some administrative tasks, while still allowing reporting on the cadence of customer engagements and updates. Gainsight Review: "A key part of the success of our Customer Success team (and more)!" Gainsight is used to give us an easy to access 360 degrees view of all things customer related - from commercials, to support, to operations and more. It is used primarily by our customer success team but then to help facilitate projects and campaigns for other teams (who might not have direct access). Have this single view of the customer is a very powerful proposition that allows us from an exec level to an individual contributor (and customer success manager) level to understand quickly where a customer is in their journey, lifecycle and product usage. Integration (automatic or more manual - e.g. using CSV files) with other data sets (e.g. for support and product usage). 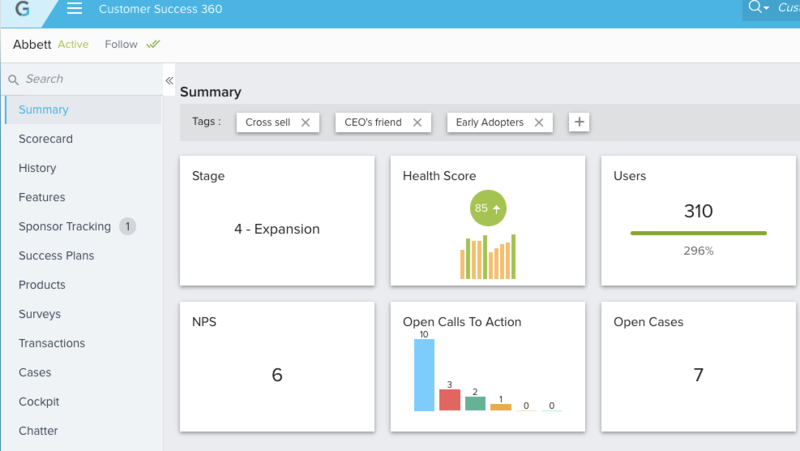 Configurable customer dashboards - showing key stats and data relevant to that customer. Industry best practice information and insights. Flexible solution that can be tailored to our specific product and team requirements. More regional support and services - think beyond just the USA. Tailored professional services packages - e.g. self contained for small and large deliverables. More automated out of the box integrations. Well suited to customer success team and organisations that need to quickly scale up. Less suited to smaller teams and operations (and lower cost). Gainsight is used by many groups in our company to view data on each of our customers, but its powerful functionality is used by our Customer Success team. This where there processes live and how they track each interaction with the customer. Its a great way to see a summary of the customer. I believe its a great tool to enable customer success in any organization. Customer Support -- they are always very fast and efficient when I put in tickets. I think Gainsight is a great tool to enable companies to truly see a holistic view of the customer. It can easily be customized to your needs and have so much functionality that can help with your overall business processes.